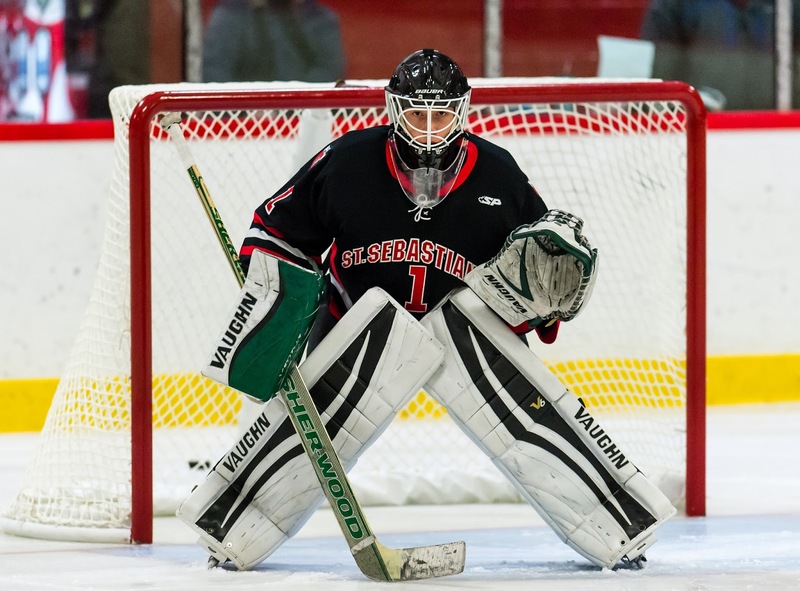 St. Sebastian’s goalie Drew Commesso, a recent decommit from New Hampshire, has now committed to BU for the 2020-21 season. Commesso, from Norwell, Mass, is listed at 6’2”, 160 by the Cape Cod Whalers 16U’s, his midget team this fall. Last season, he had a 1.77 GAA and .932 save % for the Arrows as a freshman. Commesso is expected to be invited to next Spring’s USA Hockey NTDP Evaluation Camp. Drew Commesso, #34 White, Catches Left, 6-1/150 (UNH) – He’s one of the top two goaltenders in the country at this age group. He moves well, has strong fundamentals and just stops pucks. He’ll be the go-to guy at St. Sebastian’s this winter. Also in 2016, he was one of eight 2002 goalies invited to the STX 68 and he was a standout in the 2015 Quebec International Pee-Wee Hockey Tournament, posting a 1.375 GAA for the Bay State Breakers. Commesso has been mentored by Brian Ecklund of MassCrease since he was seven years old. Ecklund joined the Terrier coaching staff prior to the 2016-17 season after several years as Harvard’s goalie coach and after playing in the NHL with Tampa Bay. ► With today’s verbal, BU’s 2020 class, which was already exceptionally strong, grows even more formidable. Commesso joins defensemen Alex Vlasic and Cade Webber, center Josh Lawrence and wings Dylan Peterson and Liam Connors. 2018 recruits Joel Farabee and Tyler Weiss each scored within a minute span in the third period as the NTDP U18s defeated the Minnesota Wilderness, 7-2, in a preseason contest. Farabee (31 points) and Weiss (29) were the top two scorers on last season’s NTDP U17 squad. Farabee added another 18 points after being called up to the U18s. "He’s a guy that is a cerebral player, thinks the game well. But at times that can be cumbersome as well, slows you down a little bit. [I’m] trying to communicate that he has great instincts, that he can trust those instincts and go out there and play fast." At Sabres’ camp, Evan Rodrigues talked about his two professional seasons and management changes in Buffalo. In the Sabres’ 3-2 OT loss to Carolina on Sunday, ERod assisted on both Buffalo goals. ● Newsday.com Shattenkirk’s transition to Rangers gets started. Two-time BU scoring leader Alex Chiasson, in Capitals camp on a PTO, sees his NHL experience and physical style providing him an opportunity to claim a bottom six spot in the Washington line-up. The NCAA has included senior Victoria Bach among candidates for the 2017-18 Patty Kazmaier Award. A unanimous first team Hockey East All-Star and a first team New England D1 All-Star last season, she won the conference scoring title with 35 points and had 49 points overall. BU kicks off its 2017-18 season Friday night with an exhibition game against Concordia, followed by Saturday afternoon's home opener vs. Merrimack.